It’s been a big week for Public Health England. Last Monday we launched our brand new health campaign One You. The response so far has been fantastic and we have been delighted to see such a positive reaction in the media, from our partners and from the public online. Most pleasing however is just how many people have been engaging with us and as of today over 430,000 people have completed the How Are You quiz. We're also excited to have the support of so many local authorities, like this example from Hounslow, and it's been fantastic to see how our local partners are using and adapting the campaign making it even more relevant, accessible and acceptable to local communities and contexts. It's great to be working with a range of employers across sectors, including Travis Perkins, Britvic Soft Drinks, NHS England and Crossrail, who have picked up One You in the workplace. Over 70% of adults are in employment, spending over a third of their waking hours at work, so it is a key space to amplify the campaign and build connections with the employer’s health offer to their staff. One You will help mobilise action for employees and bring a fresh conversation to the office or factory floor. One You is the first campaign in England to target adults in midlife in a holistic way and it will encompass all our adult health brands from now on. It follows our other successful holistic campaign, Change4Life, which will continue to be aimed at children and families. Our aim is to engage millions of people in the years to come and provide them with evidenced tools and personalised support to help them make and maintain the simple changes that can mean a longer, healthier life. One You comes at an important time. In 2014 the NHS published its Five Year Forward View which set out a clear direction for change to secure the future of the nation’s healthcare system. Achieving a ‘step-change’ in prevention is at the core of the Forward View and we need to support people in taking steps to reducing their risk of developing avoidable conditions. Currently 42% of adults in midlife are living with at least one long-term health condition and the NHS spends a minimum of £11bn a year on treating preventable illnesses caused by the effects of diet, inactivity, smoking and drinking alcohol. At the same time as supporting individuals, we also need to encourage place-based approaches to planning and providing health and care services, recognising the wider social and structural determinants of health. This is why we are currently working with our partners to help shape local Sustainability and Transformation Plans (STPs) to deliver on the vision of the Five Year Forward View. Our campaigns, including One You, which can be personalised and are able to respond to individual needs and requests, will complement the work the STPs will do in delivering system change, and together help deliver a sustainable health service for the country. Indeed, in the context of the enormous costs of treating preventable illness, our campaigns allow us to reach a huge number of people, in ways that can be tailored and targeted with relatively smaller investment. We developed One You to respond to the clear evidence that we are living longer but not necessarily in good health. Many adults are now living with one or more conditions which limit their health, wellbeing, functioning and productivity, yet many of these conditions are preventable. We also know that the burden of these conditions and diseases does not fall evenly. Those from more deprived backgrounds still have a lower life expectancy and spend more years in ill health than those from less deprived backgrounds. A lot of this is because they are more likely to demonstrate unhealthy behaviours in midlife. Our ethnographic research shows that often we do not realise that many of the behaviours we consider normal (whether that is drinking every evening or not exercising much) can have a serious impact on our health both now and in later life. The pressures of modern life; like work and family and the confusing array of health advice out there often makes it difficult to know where to start. As the campaign says, "there is only One You" and our aim is, for the first time, to respond to this by giving us the chance to view our health in a holistic way and provide the personalised information, tools and support to help us make the often small changes that can have a big impact. While One You is going to run, raise awareness and give support for years to come, the focus of adverts you may have seen on TV and online is the How Are You quiz. For the reasons expressed above, we want this quiz to engage as wide an audience as possible and get those of us who may not realise they are unhealthy to think about their health. Changing technology means we are able to direct our campaigns like never before. We know for example that 80% of our target audience for the campaign own a smart phone and 40% use Facebook daily. 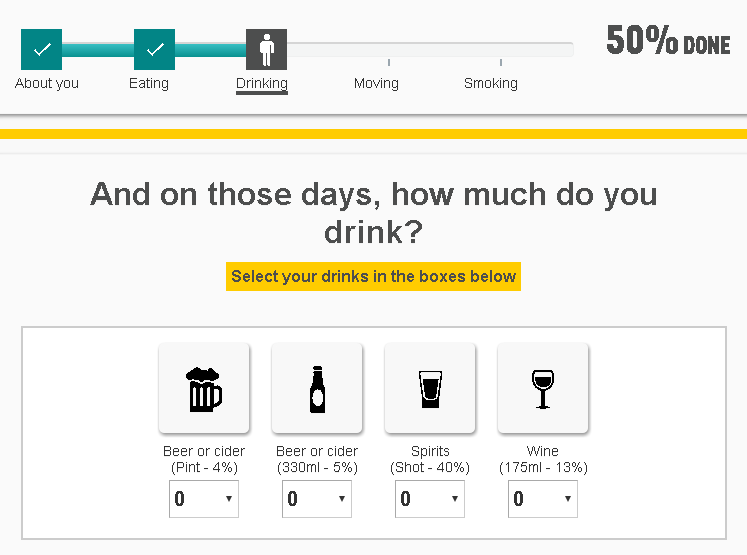 The How Are You quiz was developed with expert partners like NHS Choices and the questions, design and language were tested with over 3000 people through surveys and in face-to-face interviews. Our testing process clearly highlighted a preference for everyday language, rather than public health language like ‘obese’ or ‘wellbeing’; simple interactions like buttons and sliders; and easily understandable results like a score out of ten. Many of the tools, like the Couch to 5K app or the local services that the quiz directs people to, are well established, already successful and designed to be accessible and engaging. Measuring individual behavioural change over decades is difficult, but we are able to evaluate the success of our campaigns in a number of ways. For example, our Change4Life movement has over 2.7 million people signed up and purchase data showed an 8.6% reduction in purchasing of carbonated sugary drinks during the 2014 Smart Swaps campaign. Our stop smoking campaign Stoptober has had nearly a million sign-ups since its launch in 2012 and research shows around 60% of those signing up and using our products make it to 28 days without smoking. Our modelling shows a conservative estimate of 385,000 quit attempts attributable to Stoptober this year alone. The learning and expertise gathered through our work on all our previous campaigns has informed the development of One You and I’m sure that is why the first week has been such a success. What is clear, from the Five Year Forward View in particular, is that we can’t keep continuing to do the same thing and expect different outcomes. We need a radical upgrade in prevention and this starts with informing, encouraging and empowering individuals using a variety of tools and the latest technologies. One You is a new and exciting part of this and we hope that everyone will join us on this journey.